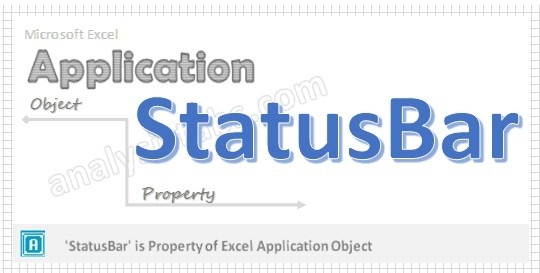 StatusBar Application Property in VBA is used to sets or returns the text in the status bar. StatusBar text will appear left bottom corner of the window. Please find the more information about StatusBar in the following section. Here syntax for StatusBar Property of application object in VBA. Where StatusBar as Variant data type. In the above syntax Application represents object and StatusBar is the Property of Application object. Please find the below example for StatusBar Property of application object in excel VBA. The below example displays the message like “Please wait, Processing the request…” in the StatusBar. You can have a look into it in the left bottom corner of the Excel window. Application.StatusBar = "Please wait, Processing the request..."
Please find the below example for StatusBar Property of application object in excel VBA. The below example does not display anything in the statusbar. Please find the below example for StatusBar Property of application object in excel VBA. Please find the one more example, it displays the message like “Please wait, Processing the request…” in the StatusBar. Step 5: Now press F5 to execute the code and observe the screen updating with using above codes.